Andhra Pradesh HFW Dept MPHA/ANM Recruitment Application form -2019: Andhra Pradesh Health and Family Welfare Dept released a new vacancy notification for the available MPHA/ANM Female posts in all govt hospitals. These MPHA/ANM Posts are for the AP state districts Govt hospitals or PHC’s of Srikakulam, East Godavari, Anantapur, West Godavari, Vizianagaram, Visakhapatnam, Krishna, Nellore, Chittoor, Guntur, Prakasam, Kadapa, and Kurnool. MPHA/ANM Female course qualified and having 1 year clinical experience candidates can apply for this Andhra Pradesh HFW ANM recruitment 2019. 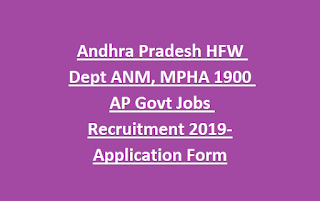 There are total 1900 MPHA/ANM vacancies are in this Andhra Pradesh HFW Dept recruitment 2019. Candidates will be selected based on ANM/MPHA Course merit and documents verification. Download application form and submit the filled application along with necessary documents to you own district DMHO office on or before 20-02-2019. Download application form at http://cfw.ap.nic.in/. 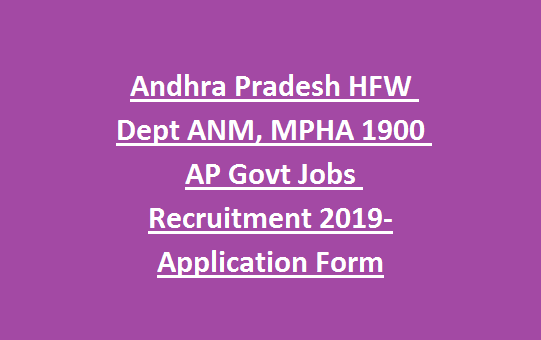 Age limits, salary, selection process, how to apply and other details of Andhra Pradesh HFW ANM Jobs recruitment 2019 is updated below. There are total 1900 vacancies are in this AP Health Family Welfare Dept recruitment ANMs/MPHA Female Recruitment 2019. As on 1-02-2019 upper age limit is 42 years and age relaxations are applicable for reserved candidates. ANM/MPHA Female Course Certificate along with 1 year clining training in any govenrment hospital. Candidates have to pay the Rs.300/- towards application in the form of DD in favor of Commissioner of Health & Family Welfare, AP, Gollapudi, Vijayawada, Paybale at Vijayawada. Reserved candidates are exempted from application fee. Based on merit in qualifying exam only candidates will be shortlisted for certificates verification. Short list will be announced on district level merit basis only. Submit application form to respective DMHO officer before the closing date of 20-02-2019. Download application form from the below given below. Applications are accepted in District Medical Health Office DMHO Office only.